Phobos, gouged and nearly shattered by a giant impact crater and beaten by thousands of meteorite impacts, is on a collision course with Mars. 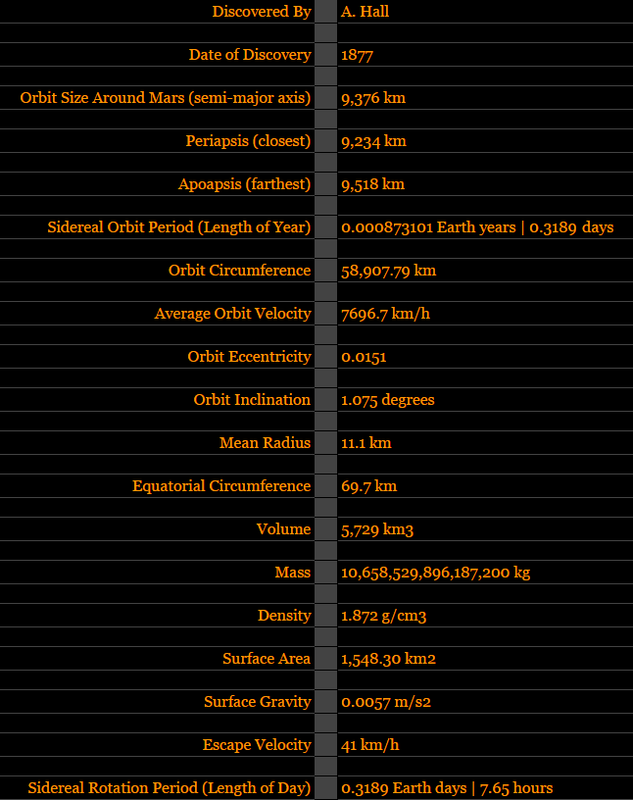 Phobos is the larger of Mars' two moons and is 27 by 22 by 18 km in diameter. It orbits Mars three times a day, and is so close to the planet's surface that in some locations on Mars it cannot always be seen. Phobos is nearing Mars at a rate of 1.8 m every hundred years; at that rate, it will either crash into Mars in 50 million years or break up into a ring. Its most prominent feature is the 6-mile crater Stickney, its impact causing streak patterns across the moon's surface. Stickney was seen by Mars Global Surveyor to be filled with fine dust, with evidence of boulders sliding down its sloped surface. Phobos and Deimos appear to be composed of C-type rock, similar to blackish carbonaceous chondrite asteroids. Observations by Mars Global Surveyor indicate that the surface of this small body has been pounded into powder by eons of meteoroid impacts, some of which started landslides that left dark trails marking the steep slopes of giant craters. Measurements of the day and night sides of Phobos show such extreme temperature variations that the sunlit side of the moon rivals a pleasant winter day in Chicago, while only a few kilometers away, on the dark side of the moon, the climate is more harsh than a night in Antarctica. High temperatures for Phobos were measured at 25 degrees Fahrenheit (-4 degrees Celsius) and lows at -170 degrees Fahrenheit (-112 degrees Celsius). This intense heat loss is likely a result of the fine dust on Phobos' surface, which is unable to retain heat. Phobos has no atmosphere. It may be a captured asteroid, but some scientists show evidence that contradicts this theory. Discovery: Phobos was discovered on 17 August 1877 by Asaph Hall. 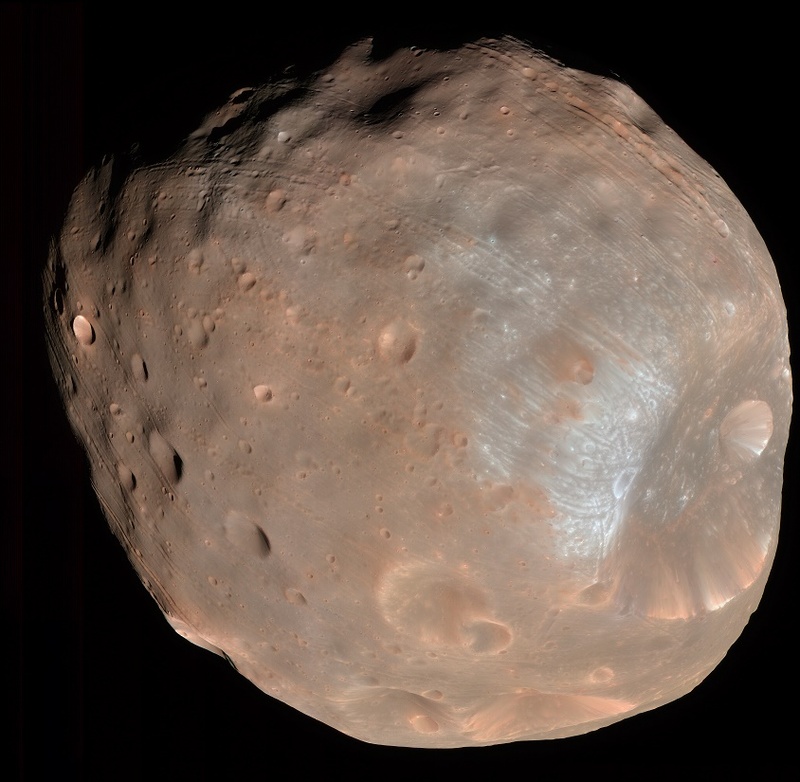 How Phobos Got its Name: Hall named Mars' moons for the mythological sons of Ares, the Greek counterpart of the Roman god, Mars. Phobos, whose name means fear or panic, is the brother of Deimos.